For the Inupiat peoples of Kivalina in the Arctic of Alaska, the price of further climate change denial could be the complete devastation of their lives and culture. Their crumbling village must be relocated to survive. But neither the government, nor the fossil fuel giants who have helped speed up the destruction of their village seem to willing to take responsibility. 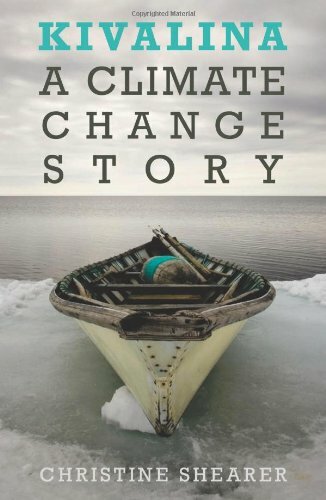 In her compelling new book Kivalina: A Climate Change Story, published by Haymarket Books, Christine Shearer traces the history of corporate greed and government compitulation and connects it to the plight of this ancient Eskimo community by the Chukchi Sea coast. A grim forewarning of what could soon be the plight of coastal communities across the world if we don’t act now. In February 2008, a tiny Alaska Native village named Kivalina filed suit against twenty-four fossil fuel companies for contributing to the village’s erosion through large greenhouse gas emissions, and for creating a false debate around climate change. The lawsuit was filed in conjunction with environmental justice and indigenous rights organizations as one of several steps in a broader push for climate justice, aiming to help Kivalina residents draw attention to their situation and call for action from government and corporate officials that had so far largely ignored them. The media gave the lawsuit brief attention that quickly faded, and the judge’s ruling was issued with little discussion or notice outside of certain legal circles. Meanwhile, the people of Kivalina are still in danger from the effects of climate change, in a situation that is going to become more common throughout the world. For roughly the past ten thousand years we have enjoyed a relatively stable climate that has allowed for the development of agriculture and civilization. Such stability is the exception, not the norm, when it comes to the earth’s 4.54 billion-year history. The Earth has oscillated between long periods of cooling (glaciations) and shorter periods of warming (interglacials), sometimes undergoing radical climate variations within the span of a century or even a decade. Evidence suggests that later glaciations correspond with periodic shifts in the earth’s orbit, tilt, and precession (movement of the axis), which can reduce the amount of energy received at the poles. This small temperature perturbation, in turn, can kickstart a glaciation through feedbacks: as ice builds, greenhouse concentrations within the oceans are sequestered and reduced in the atmosphere, and the ice reflects a greater amount of sunlight back to space (the “albedo effect”). These processes maintain the cooling, and can create the conditions for layer upon layer of cumulative ice sheets. Glaciations then give way to warmer interglacial periods, which have been correlated to increases in greenhouse gases in the atmosphere—trace gases like carbon dioxide and methane that capture heat and can amplify the initial orbital forcings. The sun’s light rays that are absorbed by oceans, land, and vegetation are eventually given off as infrared radiation, or heat energy. Due to their molecular structure (having three or more atoms), greenhouse gases vibrate at frequencies that allow them to absorb and emit this infrared radiation, sending a portion of that energy back to the Earth’s surface. During certain periods this increased heat can hasten the melting of glaciers, with the newly exposed landscape absorbing more heat and releasing more greenhouse gases, potentially leading to an interglacial period. The most recent warming shift occurred 11,700 years ago, the beginning of a relatively long and mild interglacial period known as the Holocene. Some have argued that the Holocene epoch has been supplanted by an Anthropocene, or human-influenced climate, beginning with large-scale agriculture and accelerating rapidly with the Industrial Revolution and the widespread use of fossil fuels. For the past two centuries we have been digging up and burning fossilized carbon from earlier eras — coal, oil, and natural gas — at an accelerating rate, and greatly increasing the amount of greenhouse gases in our atmosphere. While we need greenhouse gases to absorb heat and sustain life, their increasing concentration is steadily turning the furnace up on our lower atmosphere and altering our climate. Scientists are concerned not only because the effects are already apparent, such as melting glaciers, rising sea levels, and increased water vapor in the atmosphere, but because the ultimate consequences are so disturbing. 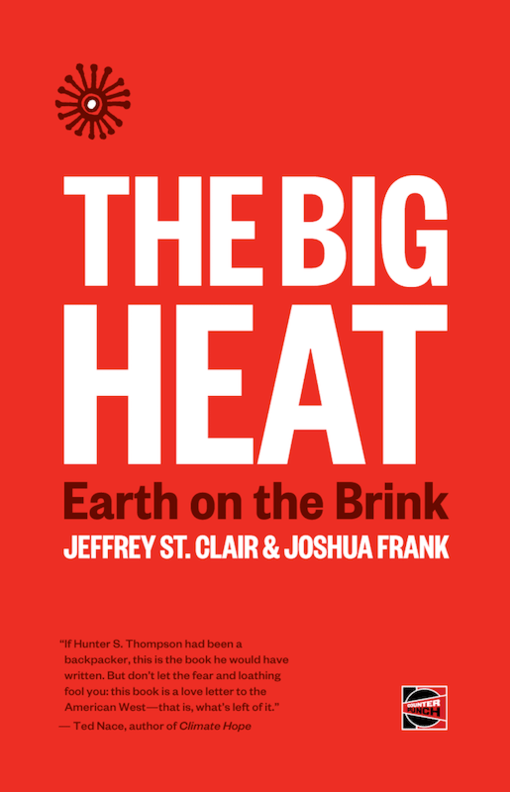 What the historic evidence suggests is that the earth has certain feedback mechanisms that can tip the planet toward extreme cooling as well as extreme heating, and that those mechanisms can be very hard if not impossible to reverse once they hit a certain threshold. As of 2011, carbon dioxide levels are about 390 parts per million (ppm), substantially higher and more rapidly built up than at any time in the eight hundred thousand years’ worth of records from air bubbles trapped in ice cores. And there is a potential warning on the horizon: numerous glaciers are melting faster than many had predicted, and the thawing permafrost—the frozen subsoil beneath the ice—can release stores of carbon dioxide and also methane, a greenhouse gas with a high and rapid heat absorption much stronger than that of carbon dioxide. The most pressing question is what large amounts of greenhouse gases will do to an already warm interglacial period, with some scientists predicting events such as the melting of glaciers and the resulting steady release of methane could bring about a “tipping point,” setting off a cascade of warming feedbacks over which we would no longer have any control. Other scientists believe we are already at or very near that tipping point, and need to begin clamping down on greenhouse gas emissions immediately. 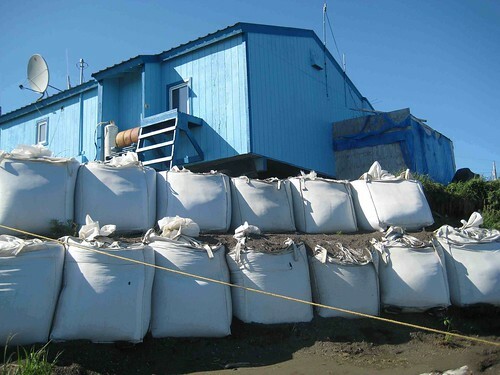 Sandbags — a stopgap measure to keep this Kivalina house from sinking. Photo by Christine Shearer. Despite the vocal concerns of scientists, pockets of the U.S. population remain unconvinced of the existence of human-caused (anthropogenic) warming, its potential severity, and the need for action. This includes people who believe climate change is a hoax; fossil fuel company executives reluctant to alter their business practices; members of think tanks, media, and other organizations that are actively trying to distort the science on climate change; and representatives of the U.S. federal government resistant to addressing climate change, particularly the George W. Bush Administration and certain members of Congress, who have been complicit in downplaying the reality and severity of climate change. Meanwhile, some are already feeling the daily effects of global warming. Among them are Alaska Natives living in the now steadily melting Arctic, such as the village of Kivalina. Perched on a thin strip of land between a sea and a lagoon, sea ice no longer adequately forms on their coastline, leaving the tiny island vulnerable to storms and erosion and requiring relocation. In the midst of government inaction on climate change, the village filed suit against fossil fuel companies for their relocation costs, and for creating a false debate around global warming: Kivalina v. ExxonMobil et al. In taking a close look at the dynamics surrounding the lawsuit, this book will lay out the development of an entire industry designed to help large industries stave off regulations and laws, known as the product defense industry (PDI). It will then explore how the PDI, fused with the fossil fuel industry’s strong and innate position within the U.S. and world economy, has helped prevent U.S. action on climate change. The result is a political environment in which it has been incredibly difficult to adequately address what is increasingly a clear and present danger, particularly for those already being affected, like the residents of Kivalina. While individuals can scale back on the amount and type of energy they consume, such options are limited without broader societal change. How to initiate effective action? People around the world are working on the answers right now. And for people like those in Kivalina, the clock is ticking. Christine Shearer is a postdoctoral scholar in science, technology, and society studies at the University of California, Santa Barbara, and a researcher for CoalSwarm, part of SourceWatch. Her work has appeared in Race Gender & Class, Conservation Letters, the Huffington Post, and Truthout. This is her first book.